The feature race at Gulfstream Park today is the $100,000 Musical Romance Stakes, at seven furlongs on dirt for fillies and mares 3-years-old and up and restricted to Florida-breds. It is the second race in a new stakes series that Gulfstream is sponsoring and funding along with the Florida Horsemen’s Benevolent & Protective Association. Gulfstream has an 11-race Saturday card with first post at 1:15 p.m. Conditions are listed as fast and firm. The Weather Channel forecast is for a five percent chance of rain during racing hours. The Musical Romance is the ninth race with scheduled post of 5:34 p.m. 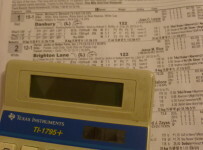 It is part of the ten-race FHBPA/Gulfstream Park Summer Stakes Series. All of the races have $100,000 purses. Six are restricted to Florida-breds. Four are Florida-preferred. Those races are open to horses from all states, with bonuses beyond the purse money for Florida-breds that finish in the top three. In an upcoming article, we will have more details on the Florida HBPA/Gulfstream program. Gulfstream today also has the $75,000 Christmas Past at 1 1/16 miles on turf for fillies and mares 3-years-old and up. It is not part of the new Florida HBPA/Gulfstream series. The Christmas Past is the tenth race with scheduled post of 6:06 p.m.
We will have coverage this afternoon and evening on our blog which can be accessed on the menu bar at the top of the home page of this Web site. *The carryover has grown to $385,146.51 on the Rainbow 6. It will be on the sixth through 11th races. On the first race, there is a carryover of $4,576.17 on the Super Hi-5. It is a $1 minimum bet that requires picking the first five finishers in correct order. *On Sunday, Gulfstream will have eleven races with first post of 1:15 p.m. The third race feature is the $50,000 The Opening Lead, an overnight handicap for 3-year-olds and up at six furlongs on dirt. *On Monday, Gulfstream will have a special Memorial Day card with first post at 1:15 p.m. The feature is the $50,000 The Home of the Brave, a starter handicap at 1 ½ miles on turf for 3-year-olds and up that have started for a claiming price during their careers.